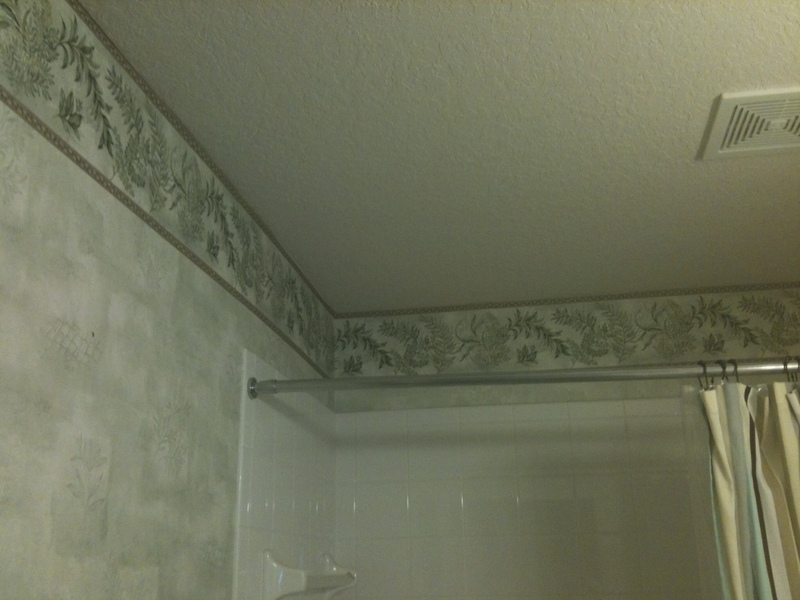 Bad wallpaper in the guest bathroom – the kind of wallpaper that looks like it belongs to a 70-year old lady. Sorry, but it had to go. We’ve been pulling off little pieces here and there since we moved in, and I never really got around to getting the equipment to fully finish the job. Ok fine, I was just procrastinating. It finally got to the point where I couldn’t take it anymore – the point where the walls looked like they were literally melting. Not to mention, we have about 20 people coming for Christmas dinner. I had procrastinated long enough. So I did some research and decided I’d go to Home Depot to rent a steamer to remove the wallpaper. Well, that didn’t happen. Have you ever had one of those days where you don’t feel like getting out of your pajamas, don’t feel like leaving the house, and you especially don’t feel like driving 10 miles to Home Depot to rent a steamer? So instead, I went to Pinterest. 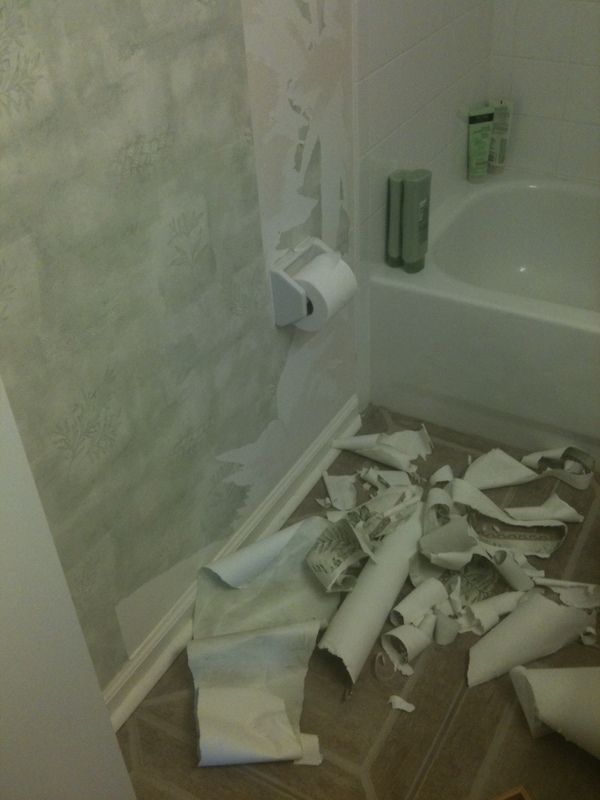 Being that I’m pretty much the laziest person alive, I decided to search for the easiest way to remove wallpaper. 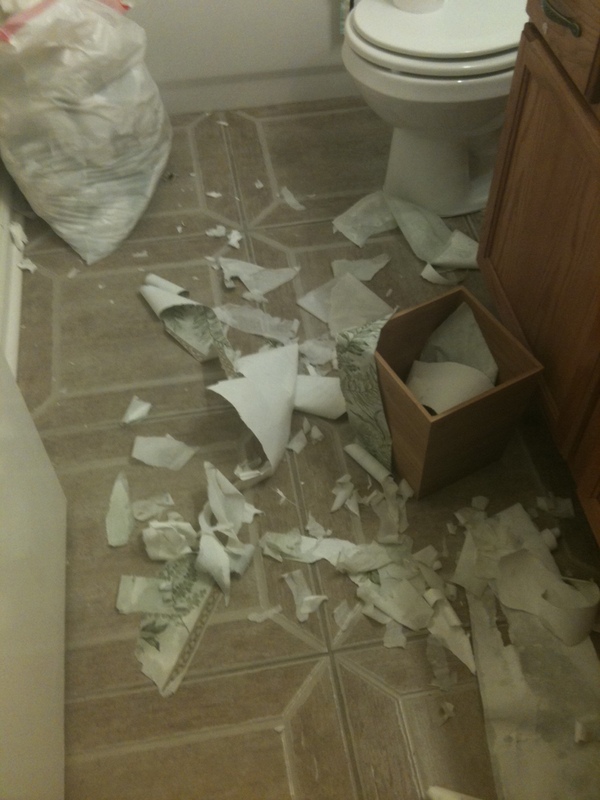 Double whammy: the easiest way to remove wallpaper with stuff I already had. You see, if I didn’t want to go out to rent a steamer, I definitely wasn’t going out to buy chemical wallpaper-remover. 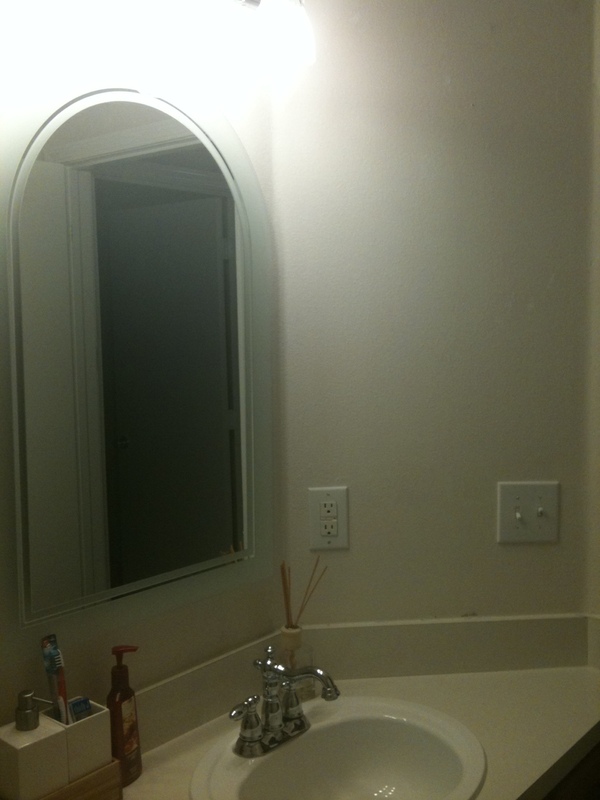 Luckily, I found this: how to remove wallpaper with vinegar and water. Glorious! I didn’t have to get out of my pajamas! 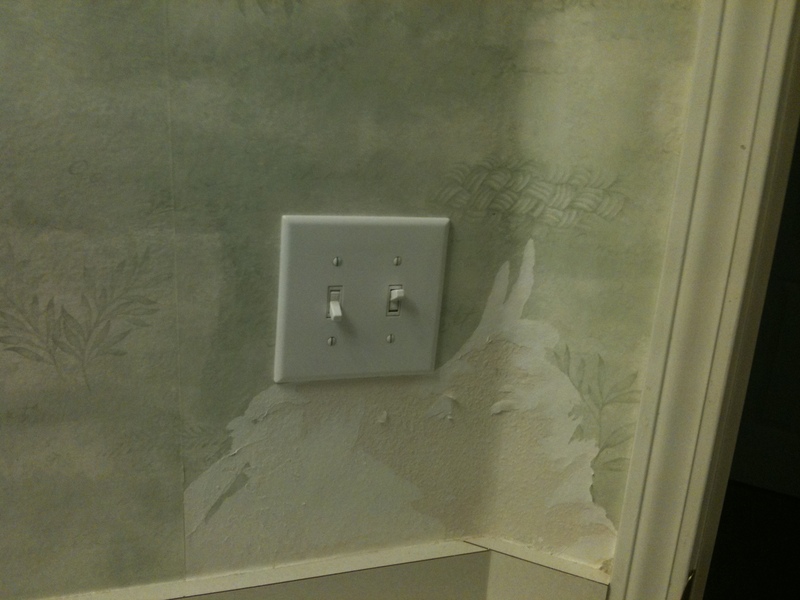 At first I tried removing the wallpaper with a screwdriver (?! 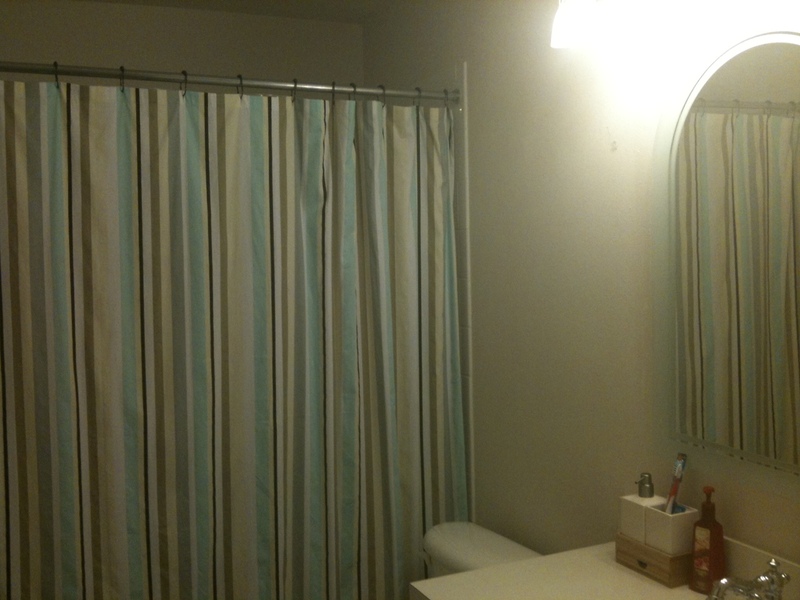 ), but I quickly gave that up because I was putting holes in the wall. Yeah, not that great. Lucky for me, I found a paint scraper and that worked well enough. As you can see – I had both large sheets and small pieces. 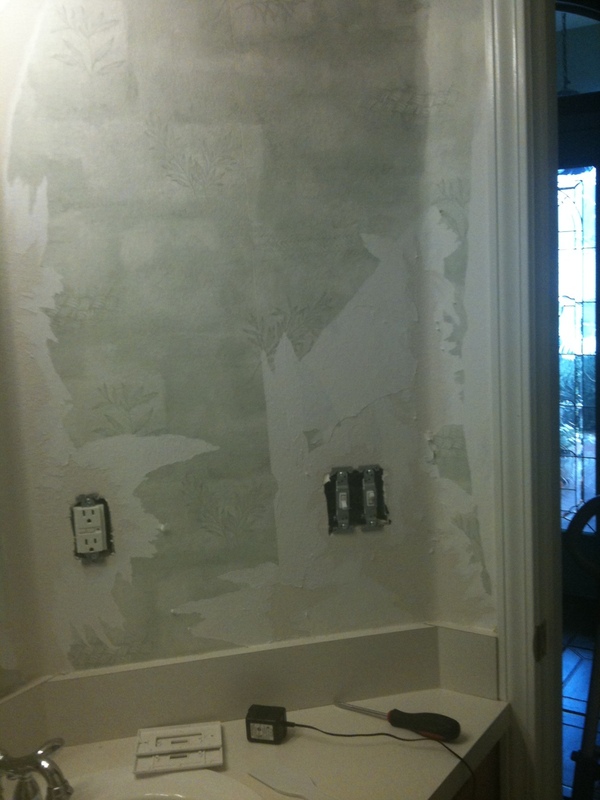 Apparently the wallpaper was put on with a lot of adhesive in some spots, and then little-to-none in other parts. About halfway through I realized that I was too far along to quit – even though I was going on 4 hours. Two stuffed trash bags and 6 hours later, I finally finished. And although it didn’t go as quickly as I would’ve liked, the white walls are way better than the old lady wallpaper that was once there before it. It looks whiter, brighter, and a whole lot better. Don’t you agree? Looked fine before to me, but I’m an old woman! Half downy fabric softener and half water. 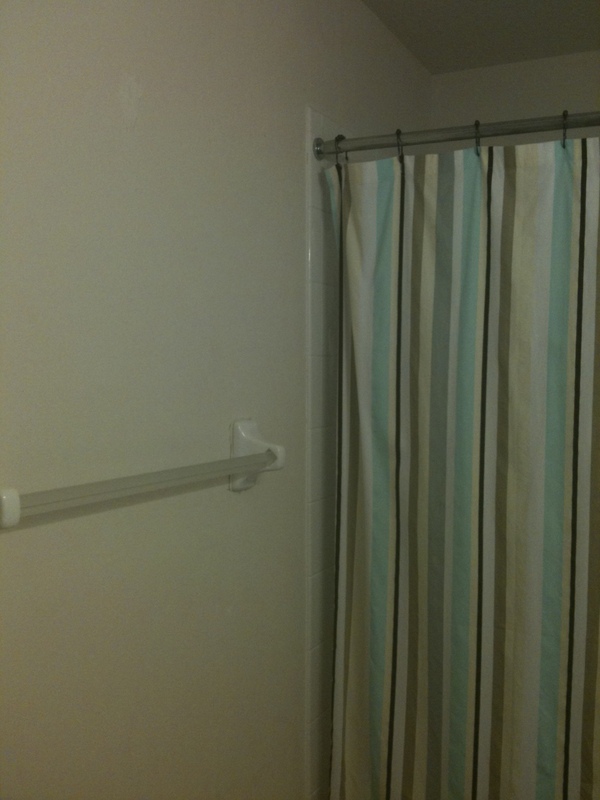 Pull the wallpaper cover off first if you can. Then sponge it on the backing. You don’t have to wait for it to work. Leaves the room smelling awesome for weeks. So you pealed it off and just painted or did you need to sand at all first? I sanded the parts that had leftover glue but it wasn’t much (this will vary based on how much wallpaper glue was used and also how long the wallpaper has been on the wall) we didn’t paint but you could certainly paint after sanding! so glad it worked for you! way cheaper and a lot easier, eh? Uses for White Vinegar – Grow. Pray. Build. --- Bloom Where You're Planted.